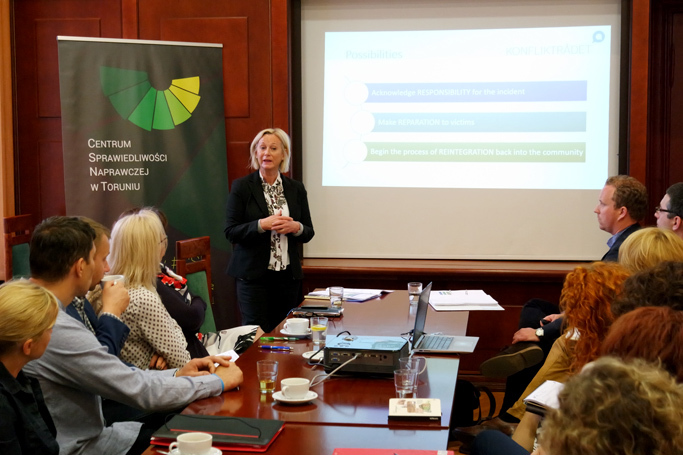 Between May 21-29, 2015 we hosted representatives of the Norwegian Mediation Service – Konfliktraadet, which partners with Court Watch Poland Foundation in the EEA Grants project on ‚Restorative Justice Centers’. Our guests, Bjorg Sletten and Andres Espen EldA?y, shared their experience with mediation and other restorative measures with judges, prosecutors, probation officers, mediators and representatives of NGOs during a series of workshops organized in Białystok and Toruń. The trainings were also addressed at the staff and collaborators of the newly established Restorative Justice Centers in both cities.